SAN FRANCISCO — The Japanese Cultural and Community Center of Northern California announces that applications are being accepted for the Kase Nikkei Community Scholarship Program (Kase Program). Kase interns Casey Ikeda (top left), Miya Yung (top right), Sara Matsumoto (lower left), Lauren Morimoto (bottom right). The Kase Program, coordinated by the JCCCNC in cooperation with the Japanese Community Youth Council, aims to support the development of the next generation of community leaders. The program consists of two phases. 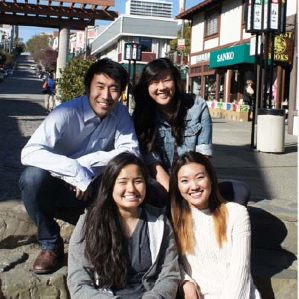 Phase 1 is an eight-week, full-time Summer Community Internship at a non-profit organization in San Francisco’s Japantown. Interns will receive valuable training in community service, volunteerism, cultural preservation and networking with various community leaders. One day of each week is reserved for the interns to visit various Japanese American organizations and community leaders, and participate in leadership and career development workshops to expand their personal knowledge of available community services and resources. Phase 2 is from September 2013 to May 2014. Interns will participate in a part-time (approximately 40 hours per month) Career Internship that will focus on each student’s individual career interest and development needs. Successful Japanese American professionals will be identified to host interns and provide guidance and experience in specific fields. Up to five participants will be selected to each receive a $5,000 educational scholarship for their successful completion of the Kase Program. Students will be selected based on their application, letter of recommendation and interview. Participants must be available full-time for the Summer Community Internship from June 23 to Aug. 16 and part-time for the Career Internship from September 2013 to May 2014. Japanese ancestry is not a requirement but a strong background of involvement in the Japanese American community is required, as well as a desire to learn about Japanese/Japanese American culture/heritage and the San Francisco Japantown community. To be eligible for the 2013 program, the applicant must be continuing or entering college during the fall 2013 school year and be 18 years old at the start of the program (birth date on or before June 23, 1995). Applications and letter of recommendation are due on Friday, April 26. Qualified applicants will be invited to a personal interview April 29-May 3 and participants will be selected in early May. Applications are available online at www.jcccnc.org/programs/nci.htm. Applications can be faxed to (415) 567-4222 to meet the April 26 deadline, but the original application and letter of recommendation need to be submitted by April 29 to be considered for the program.